Greyhounds are some of the best kinds of dogs you could invite into your home and heart. They’re laid back, gentle animals, making them the perfect breed to have around children, plants, and anyone with a more nervous disposition. You won't need to worry about them ruining your furniture. Greyhounds’ short coats makes grooming easy, and what’s more, these dogs are sweet, friendly, and loving. What more could you want from a pup? Once you own a greyhound, you’ll understand what all the hype is about. Pets Best focuses on giving you the type of care that fits your circumstances, so you don’t end up paying for a lot of extras you don’t need. You can choose the flat rate accident coverage for $9, for example, or you can get more inclusive coverage that also covers routine care. Pets Best has an outstanding reputation with a 9.6 out of 10 on TrustPilot and an A+ from the BBB. What’s more, Pets Best claims are processed in 5 days or less, its plans cover hereditary and congenital conditions, and it covers any licensed veterinarian, emergency clinics, and specialists. With four levels of coverage, ASPCA insurance covers a wide spectrum of costs, including regular exams, lab tests, x-rays, and diagnostic procedures. This insurer is an excellent choice for greyhound owners because it will cover hereditary and congenital diseases and therapies. Some standout features of ASPCA insurance include customizable coverage, no upper age limit, discounts for multiple pets, and flexible payments and care options. Embrace really turns the whole insurance industry on its head, offering affordable coverage with a twist. This company actually rewards you for keeping your pets healthier by granting them lower deductibles at the end of each year. Additionally, Embrace’s rewards program helps cover some of the routine veterinary care costs that aren’t typically covered. Things like grooming and training are available for coverage with this innovative company. Embrace is also a feel-good insurer, donating $2 for every policy sold to a pet-centered charity, and it donates additional funds to shelters and other organizations as well. Owners will appreciate the no per incident limits structure, lack of transaction fees, and 5% discount for direct payments. Pet Assure has many of the same benefits as other insurers on this list. You’ll get emergency and illness coverage, no upper age limit, and no annual limits. Pet Assure sets itself apart though, by covering just about anything you can throw at it, even pre-existing conditions. Any pet will be covered by this company regardless of breed or age. Additionally, you can try it risk-free for 45 days. Pet Assure covers all medical services as well, can be combined with other pet insurances, and there are zero deductibles. PetFirst is a popular pet insurance provider because it offers a lot of benefits to owners including a wider range of coverage, a healthy pet discount, and a fast and easy enrollment process. You will also appreciate the multi-pet discount PetFirst offers its customers. Cancer and other diseases are covered by all plans with this company. If you want to get additional coverage, PetFirst will even cover routine wellness procedures, and your dog will be insured no matter how old he gets. Learn from the mistakes of others. Go online and do some research. See what other pet owners say about a service, what others' experiences have been, and whether or not the company comes highly recommended. No service will have 100% positive feedback, but compare the majority of reviews with other companies to see which has the best reputation overall. While reputation is important, if an insurer doesn’t have the services you need, they won’t be of much good to you or your greyhound friend. For example, PetFirst has great dental coverage, but if you need something for your pup’s heart, this feature won’t be any good to you. Speak to a consultant or a vet to see what issues you might be facing, and choose an insurance company based on your needs. Similarly, you might need specific features that a service provides but not need others. There’s no sense in paying for a lot of features that aren’t relevant to you. For example, if you have several pets at home, then having a multiple pet discount will be economically advantageous for you. On the other hand, your young and healthy greyhound will likely not need hospital stays, and you may not want to pay more for this perk. Greyhounds have great metabolisms for breaking down protein. Look for dry or wet kibble that has protein as one of its first ingredients. Avoid brands that load their products up with sugar and corn, as it can be difficult for them to digest. Feed your greyhound twice a day, and keep water always available. While greyhounds need less exercise than some other dog breeds, they still need to get out and run around. Give your greyhound approximately one hour of exercise daily to keep her fit. This can be a run around the yard, a brisk walk, or playing fetch with a favorite toy. Because of their short coats and minimal body fat, greyhounds get colder than other dogs and overheat quickly in the sun. Keep them inside the majority of the time, and put on a coat or sweater if you feel it's getting too cold (below 32 degrees). Greyhounds gain a lot from taking walks with their owners. This helps build a closer bond, provides mental stimulation, and physically challenges them in different ways. Dental hygiene is very important in dogs, including your greyhound. Brush once a week to avoid plaque, cavities, and other issues with gums and teeth. Greyhounds will happily comply with this dental hygiene regimen. An eye disease that is common in greyhounds, Pannus can be treated through eye drops and injections. When gas enters the stomach, causing it to expand, greyhounds get bloated. This is actually fatally dangerous because the stomach twists and the airflow is obstructed. If you notice even slight bloating, bring your greyhound to the vet immediately. Otherwise known as bone cancer, greyhounds develop this frequently after stints at the race track. Genetic problems such as heartworms are common in greyhounds. Vets usually prescribe a simple medication to help avoid these issues. 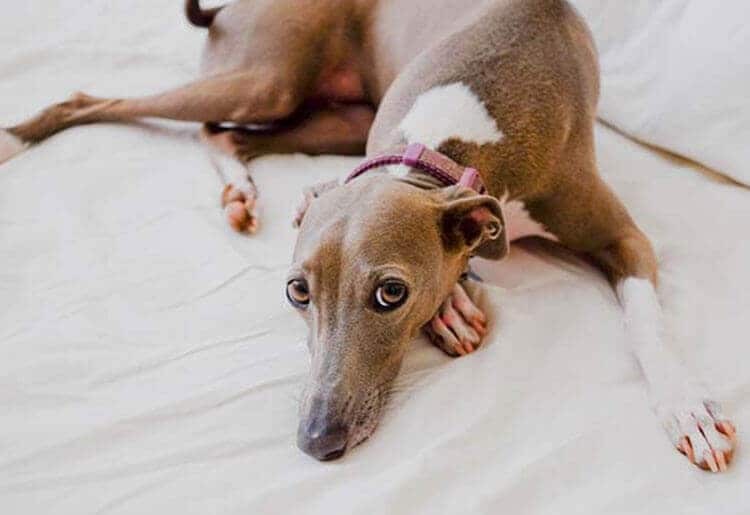 Heart murmurs are more common in greyhounds because they actually have big hearts. Go figure. Investing in a greyhound is investing in a friend and a lovable companion for the next decade or so. You'll enjoy years of quiet, fun, and friendly times together. Be sure to care for your greyhound to give him a long, happy life by your side.